This room will be for four young men, all wheelchair bound. That's what everyone sees about these guys, but who they are go so much deeper. $1540 per month for the coming 5 years. Artyom is a sweet young man, 28 years of age now, he was moved out of the orphanage within the first year or so after I began working with the teens full-time in 2008. He was at our very first picnic, I remeber the thrill on his face, simply enjoying being in a park, out doors, having fun. This simple pleasure has been rare in his life. When he turned 18, he was moved to Kahovka, where Oksana has also resided. This change of location was not a good one for Artyom. He's lived in a room with 3 older men who do not appreciate Artyom, they don't even try. He desires to learn and asks questions of others, as he's rarely had an opportunity to be in classroom. He has been shunned, by them and others. When he goes to eat in the cafeteria he's been asked to sit else where. The simple relationship of friendship has only been offered to him by Oksana, so whenever we've come to get her for appointments or for trips, he's present and asked if he could come too. 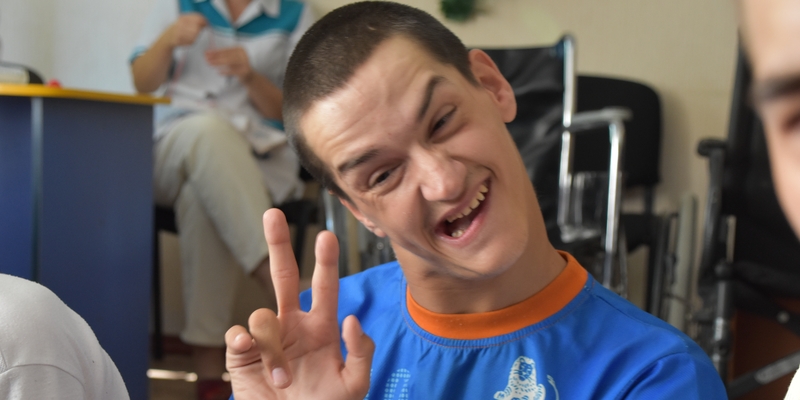 Housing for him has been a challenge, but this past fall he asked if we could bring him into Kherson, his favorite artist was doing a concerte. His good friend here, Jaan, went with him and Artyom shared he really enjoyed it. After the long weekend away, we drove Artyom back to Kahovka. But a few days later the head doctor said that she was sending Artyom to the asylum and that afterwards, he would not be returning to Kahovka, He did not belong there. Our hearts were broken and felt helpless as the system here is not one that can be negotiated with. Two months after Artyom has been placed in the asylum, he was released and put in a another institution in the village of Ushkolka. So, on February 12, we made the trip to see our buddy, and let me just share, Kiary has been the furthest we've driven for consistant visits, for one reason, the roads. They are dirt, even the "highways" that the tractor trailers use to transport crops, once you get into the countryside. One can imagine in the spring time with all the rain how grand the conditions become and riotous the driving could be. Usholka is 300km beyond Kiary, out on this peninsula that is beautiful in the areas that surround it, but are a far cry from the location of the institution itself. Two buildings, each two stories, that looked to have 6 or 8 rooms on each floor with a main dinning hall/office building and an outhouse. And though the head staff were not present that day, and quarintine was being enforced, we were admitted to share with Artyom, but only him. This we accepted with graciousness. The delight on Artyom's face when he saw us through the window was worth every kilometer of bumps and potholes along the way. Of the five poeple who were finally able to get him up the steep slope of a ramp and in the two doors of the dinning hall entry way, the social worker was the one who welcomed us, delighted we came to share and expresed how glad she was that we care. As a representative, for Artyom and three others his age, she said that it was very confusing to her why these young people had been placed in an institution for the elderly. Seeing we had brought gifts for Artyom, would we consider doing so next time for the other young men too. I can't help but believe that the Lord has given us an open door, through this gal, so when the time comes to move Artyom to a better place, Stephen's Home, she will be in favor of this decision. Artyom did share, amidst his excitement, that his roommate is older but helpful to him. He appreared to be healthier, filled out some, so we are prayerful, that until we can move him, Artyom is where God has placed him. One important note about Artyom, he loves Jesus, reads his Bible, please pray with and for him. Sasha is a guy with Cerebral Palsy and though he's a man of few words, he's very expessive. Like many others with palsy, speech takes all ones focused effort to formulate and most people don't have time to wait patiently to listen. I'll share with you, once Sasha's in Stephen's Home with a computer in front of him he's going to be talking a mile a minute an it's going to take quite and effort to slow him down. At the orphanage in Oleshky, Sasha was placed in a group, surrounded by little guys, close to half his age. I stared working with him just a few years before he was moved out to Dnipriany and found out he's quite intellegant. But Sasha has also learned to play dumb, as so many have assumed that of him his whole life. Below that initial surface he's quite the treasure, just waiting to be discovered.